This piece consists of a framed collage made with single pages taken from two different texts: Bob Woodwards Veil: The Secret Wars of the CIA and a book of art reproductions. 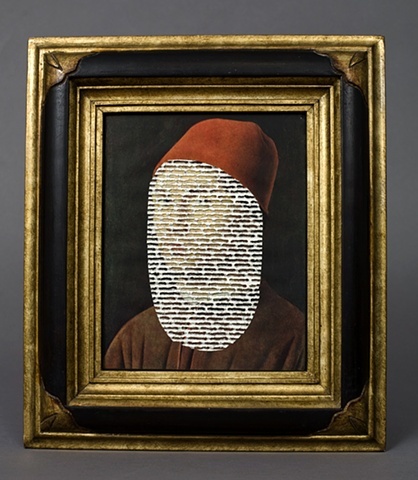 The page from Veil, which has been cut into an oval shape with all the words drilled out, is placed over a reproduction of Antonello da Messinas Portrait of a Man (circa 1475). The page of drilled-out text, which seems to have been poured over the face from underneath the red hat, appears like a burka through which, not a womans, but a mans eyes hopelessly peer out, as if through a prison of broken letters and unrecognizable words.